Technology is enjoyed in every room of the home, including the bedroom and bathroom. There's nothing like waking up to the latest news or stock report (or your favorite music) first thing in the morning. And there's nothing better than relaxing in bed at the end of a long day, while you watch your favorite TV show. These delightful music-loving clients have created a lovely respite, with music in every room of their low-rise condo in Dallas. They contacted us to upgrade their bedroom system. Up to the challenge, we selected a pair of versatile wall-mounted speakers from Totem. We cleverly nestled them beside matching chairs flanking their dresser, above which the TV is mounted. This provides beautiful music in the entire space. During a remodel, one of our clients asked us to create a small theater in their master bedroom. We recommended a Pioneer flatscreen in their master sitting area—it's easy to view from the sofa and the bed. We provided custom color-matched on-wall speakers that are placed to the left, center, and right of the flat screen. (This is a space-saving alternative to floor-standing speakers in a small room that doesn't require big sound.) 5.1 surround is provided by rear on-wall speakers, and a small but mighty REL subwoofer. These SpeakerCraft waterproof speakers are perfect for this music-loving couple. 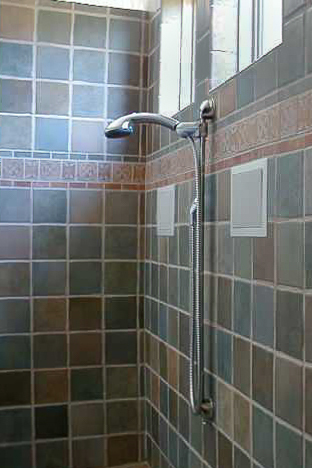 Wanting to start their day with their favorite music, our clients just had to have in-shower speakers. You don't have to rush to the family room TV to stay connected anymore. Now, when our clients build or remodel, they usually request that we include a television in the design of their master suite. This allows our clients to stay connected—watch the weather, traffic, and stock reports first thing in the morning. Or, keep an eye on the kids in the backyard while taking a quick shower. Audio is usually delivered by in-ceiling water-resistant speakers. Bathrooms are a good place to utilize in-wall touchscreen control. 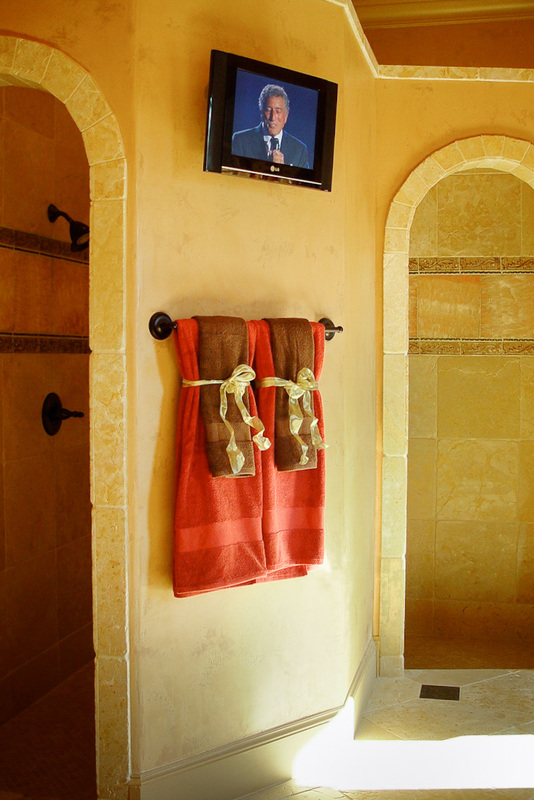 From the beautiful stone tub in this contemporary master bath, the homeowners can soak and watch the news or relax with a favorite show on their LG HD TV. Our clients can access all the house audio/video functions, including CCTV camera viewing. In-ceiling speakers deliver crisp and even sound. Control is by in-wall color touchscreen, and a wireless handheld RTI remote. In this very large master suite, an articulating arm gives our clients the viewing flexibility they require of their TV. The wide extension capabilities of a Chief mount allow the homeowners to direct the TV toward any point in the room. They enjoy hidden surround with their 52" Sony XBR. The audio/video gear for the entire home is housed upstairs in a dedicated equipment closet. An RTI color touchscreen controls the audio and video.